We propose to the community of GRACE users a new website for plotting and comparing GRACE solutions. 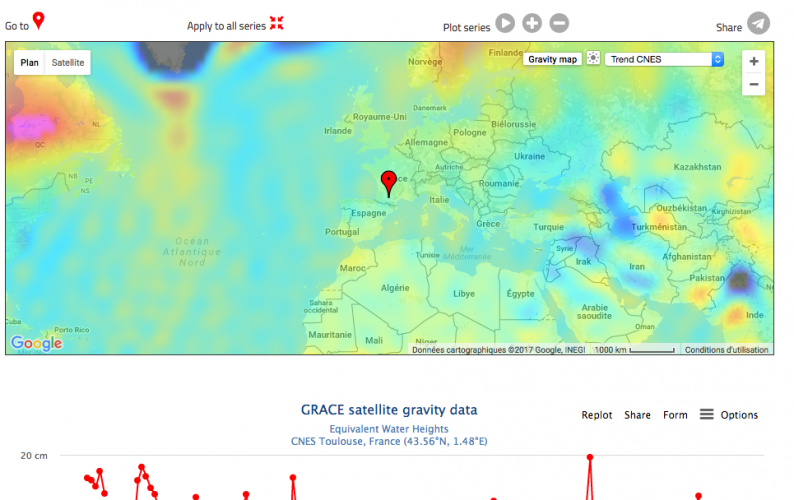 On this website you will be able to plot time series of GRACE solutions in terms of equivalent water height (EWH), either for point locations, spherical rectangles or polygons (up to 10 summits), or hydrological basins (approx. 30 are available, ordered by surface area from the Amazon to the Brahmaputra). Not only the CNES/GRGS releases are present there, but also the three RL05 releases from CSR, GFZ and JPL, filtered using the DDK5 filter. The series of CSR, GFZ and JPL were obtained from the ICGEM data base. We hope this website can be a useful tool for most GRACE users whether they want to conduct scientific research, solutions comparisons or evaluation. It is still in a development phase and all suggestions for improvement are welcome. The location of this new site is: www.thegraceplotter.com.